Chinook™ Medical Gear is proud to announce that we have received six new National Stock Numbers. NSN products are officially recognized as the standardization of parts and supplies for civilian and military operations by the United States government, the North Atlantic Treaty Organization (NATO), and many governments around the world, including the Department of Defense (DOD). The 13-digit NSN code is used to identify and monitor all criteria as per the Defense Logistics Agency, including military requirements for testing and evaluation. The Ultra-Lite Gamow™ Bag (pronounced ‘Gam-off’) is a unique, portable Hyperbaric Chamber for the treatment of altitude sickness. By increasing air pressure around the patient, the Ultra-Lite Gamow Bag simulates a descent of several thousand feet, thus improving the symptoms of Acute Mountain Sickness (AMS). The Ultra-Lite Gamow™ Bag is constructed out of a durable lightweight nylon fabric and reinforced with circular nylon webbing that is capable of litter carry. A lengthwise zipper allows for easy entrance and exit for the patient and the 2 clear windows allow for patient monitoring. The Bag is pressurized with ambient air up to 2 psi by use of a lightweight foot pump; there is a release valve to prevent over-inflation. The Ultra-Lite Gamow Bag and foot pump are packaged in a lightweight nylon drawstring bag for transportation and weighs a total of 7.7 pounds, making it 5 pounds lighter than the standard Gamow Bag. Gamow Bag 4.65 lb. 6.1 lb. Carry Bag .25 lb. 2.05 lb. Foot Pump 2.55 lb. 4.4 lb. Manual .25 lb. .15 lb. The TMM™-FBTK is designed as a stand-alone skill set module to collect and transfuse fresh whole blood. The TMM-FBTK also meets or exceeds current blood bank standards, TMEPS guidelines, and military training protocols for this procedure. This module can also be utilized for training and instructional purposes. Developed with extensive research and feedback from the Special Operations community, the TMM™-FBT-SO contains essential items needed to collect and transfuse fresh whole blood in a compact, vacuum sealed, package. The TMM™-FBT-SO was specifically designed for field forward missions in the most remote and austere environments. The Chinook™ TMM™-CR-SO contains the necessary items to establish a surgical airway when standard procedures are unsuccessful. By request from the Special Operations community, the TMM-CR-SO is packaged as a non-sterile module with all items removed from their packaging for easy access in order to expedite treatment of a compromised airway. The TMM™-SL-SO contains the items needed for starting and securing a saline lock for quick and effective intravenous cannulation. Requested by the Special Operations community, this lightweight module contains a pre-filled 5cc syringe with Normal Saline in order to flush when needed. The TMM™- CT-SO is designed for the emergency Chest Tube Thoracotomy. 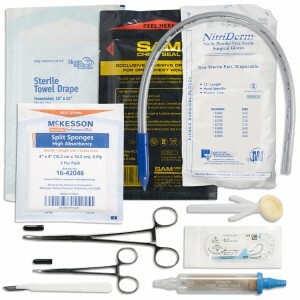 Requested by the Special Operations community, this module contains basic supplies necessary for emergency field chest tube insertion. The TMM™-CT-SO module is to be used only by those who have formal training in this procedure. This vacuum packed, all-in-one module offers the ultimate in time savings and convenience.